Sunday's Greek election is a choice between staying in the euro and going back to the drachma, the leader of the centre-right New Democracy party has told a final campaign rally in Athens. The general election, the second in six weeks, is seen as crucial to Greece's future in the eurozone. New Democracy broadly accepts the EU/IMF bailout of debt-laden Greece but wants changes to the terms. Main opponents Syriza reject the terms of the bailout but back the euro. Syriza surged into second place on 6 May, in an election that produced an inconclusive result, with no party or coalition able to form a government. Antonis Samaras framed this election as a series of choices: in the euro or out, development or destruction, jobs or unemployment, with allies or in isolation. The message was that only New Democracy could provide the former, whereas Syriza would be responsible for the latter. But the challenge for Mr Samaras is immense: to persuade this nation, tired of the corruption of the old parties, that New Democracy has changed and is distancing itself from the failed policies of the past. Many here won't believe him and are willing to take a leap into the unknown with Syriza. Saturday will be quiet here - with no campaigning before polls open on Sunday morning. And so Greece's most unpredictable and crucial election for decades is drawing close: one with implications far beyond this country's borders. Europe is holding its breath. Unofficial opinion polls suggest a fall in support for anti-bailout parties. Under Greek election law, official opinion polls are banned in the two weeks before the election. Tough austerity measures were attached to the two international bailouts awarded to Greece, an initial package worth 110bn euros (£89bn; $138bn) in 2010, then a follow-up last year worth 130bn euros. The two main parties in the previous government, New Democracy and the centre-left Pasok, agreed to the terms for the second bailout, incurring the anger of many Greek voters. New Democracy's support slipped from 33.5% in 2009 to less than 19% of the vote while Pasok's share plummeted from 43% to just over 13%. While five of the seven main political groups reject the last bailout, only one - the Communists - wants the country to abandon the euro. Germany, which has the eurozone's most powerful economy, insists Greece, like other member-states which have received international bailouts, must abide by the austerity conditions. German Bundesbank (central bank) chief Jens Weidmann repeated the warning on Friday, adding that the eurozone could not allow any country to "blackmail" it with the threat of financial contagion. Mr Samaras told his supporters on Friday that Greece would exit its financial crisis but not the euro. "The first choice the Greek people must make is: euro versus drachma," he told the rally in front of parliament in Syntagma Square. "We will exit the crisis; we will not exit the euro. We will not let anyone take us out of Europe," he said. 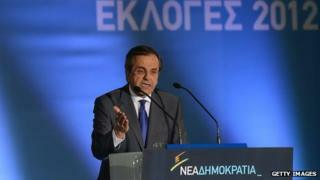 Mr Samaras has accused other parties of "playing poker" with Greece. At Syriza's final rally on Thursday, leader Alexis Tsipras renewed his pledge to tear up the bailout conditions, which involve drastic spending cuts, tax rises, and labour market and pension reforms. "The memorandum of bankruptcy will belong to the past on Monday," he told supporters in Omonia Square. "Brussels expect us, we are coming on Monday to negotiate over people's rights, to cancel the bailout." Pointing to the huge bank loan package deal between the EU and Spain on Sunday, he argued that a bailout was possible without the kind of drastic cuts demanded of Greece. "Spain negotiated and succeeded in taking financial support without a fiscal consolidation package, despite the lenders' threats and blackmail," Mr Tsipras said. Interviewed by Spanish daily El Pais, Jens Weidmann called for the eurozone to impose broad conditions on Spain over its loan package, worth up to 100bn euros. He warned that Greece, but also the Irish Republic and Portugal, had been given the impression that this was a "rescue with no conditionality outside the financial system" and this was "already eroding the commitment to the terms of the existing programmes". "But foot-dragging on addressing the structural problems will perpetuate the crisis, and the market reaction reflects this concern," Germany's top banker said.